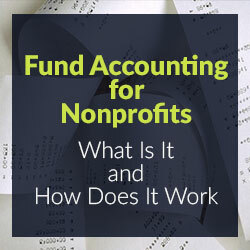 For a nonprofit, accounting is very important to keep a high level of financial transparency. Nonprofits wanting to keep their tax-exempt status must keep accurate financial records which document that the funds received were used for charitable purposes. I had a chance to sit down with Michelle Carley, founder of Big E-Z Bookkeeping Software, which hundreds of nonprofits use to understand common mistakes nonprofits make and best practices when doing their accounting records. Just like for-profit organizations, nonprofits make mistakes. 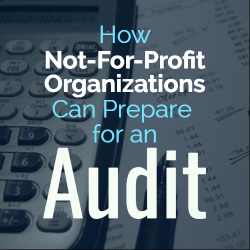 Do you have one major tip for nonprofits regarding their accounting? Michelle: One problem I see with nonprofits over and over is a lack of good backups of their important electronic files and documents. Nobody thinks their computers will crash, but as an expert in accounting who has seen thousands of scenarios, I’m here to tell you they do! It even happened to me once long ago. I was working as the accountant for a nonprofit organization when the owner to my surprise decided to have a crew come into the office one weekend to do renovations. I was not aware of the renovations to take place and, to be honest, I would not have known how to protect the computer from its demise either way. I later found out that the computer should have been covered with plastic wrap and tape or removed from the office entirely, so dust from the sawing of wood would not find its way into the hard drive. When I tried to access it on Monday morning the hard drive crashed. Fortunately for me, I had a backup and could recover the nonprofit’s accounting data except for the last two weeks. Another nonprofit I know of was not so fortunate with the important documents they had on their computer. They had no backups and had to re-enter all of their data from the beginning of the year. Sadly the nonprofit learned a costly and time-consuming mistake, so remember to backup often. Nonprofits usually have a treasurer handle the bookkeeping for the organization. Treasurers of small nonprofits are not usually paid to keep the books and so there can be a frequent turnover of volunteer treasurers. Do you have a tip for how to make this transition easy? Michelle: First, it is so important that the accounting software you choose for your nonprofit be easy to use. If it’s a burden for the current nonprofit’s treasurer, it will be much harder to train someone new to use it. Make your volunteers happy with an easy-to-use program that won’t waste their time and you will find it easier to get volunteers to keep the books. Many nonprofits overlook an important aspect of accounting software which is, how easy the software is to correct? Face it, all nonprofit treasurers make mistakes and when they do, it is so important that they can find the accounting mistake and correct it easily. No nonprofit staff or volunteer wants to spend tons of time searching for answers online to correct an error in their nonprofit accounting software. It should be just as easy to correct as it was to enter. The IRS has certain nonprofit accounting requirements and the generally accepted accounting principles (GAAP) are important for nonprofits to follow too. 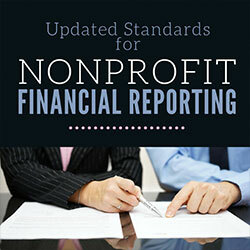 Nonprofit accounting rules and regulations change throughout the years. Where are the best places for nonprofits to keep up with the current rules and regulations? Which sites do you see as most informative and accurate? Michelle: The Financial Accounting Standards Board (FASB) is an authority for U.S.-based nonprofits. There are always new things being proposed and improved. The FASB has a page called “In the News” and they post to it often: https://www.fasb.org/jsp/FASB/Page/SectionPage&cid=1218220131727. You might consider reading up on what is happening in the nonprofit world. Like everything on the web, you will need to use your discretion to determine what affects you and your nonprofit and weed out the rest. 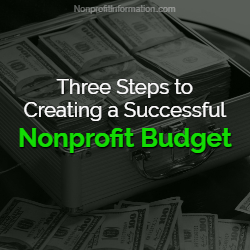 What are the rules of thumb when putting together a nonprofit operational budget? And how do you keep your donors happy that you are supporting your nonprofit’s mission, but make them understand there are operational expenses? Michelle: Budgets can be difficult to determine. When you are starting out you have nothing to compare your actual numbers against, so you have to dream them up. You will need to try to base your income and expenses on what the industry standard is for your type of non-profit. Of course, that will be a guess because no two nonprofits are exactly the same. It’s once you have some history behind you that you can better determine how much income to expect and how much you can spend in the coming year. The old saying “practice makes perfect” certainly applies here. As for your donors, the same is true. You need to ask yourself what are other nonprofits doing to make their donors happy, then tweak it with responses from your own donors. Donors like to know where their money is being spent. Over time they will let you know, but if they don’t, a well-thought-out survey may be in order. Some nonprofits need or want to use inexpensive accounting software to track their revenue and expenses. Sometimes the software will be for-profit accounting software. Is it okay to use the less expensive programs if they have terminology that isn’t consistent with fund accounting or nonprofit accounting? Michelle: Absolutely! All accounting software does the same thing: it crunches numbers down to totals that make sense to you and those totals are so necessary to stay compliant and so needed for tax time. Whether you call it donations, income, revenue, or sales, it is still the same thing. It is critical that nonprofits reconcile their accounting and development schedules on at least a monthly basis. 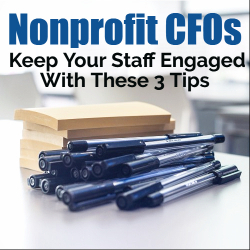 Nonprofits also need clear protocols for communicating important accounting activities. Otherwise, nonprofits experience negative consequences such as low to no funds, or, even worse, embezzlement. 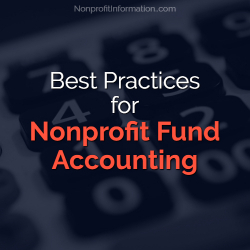 For example, if grants or fundraising teams fail to inform nonprofit accounting departments about funds on a timely basis, the latter won’t be aware of the grants or funds for financial reporting requirements and could forfeit funds for noncompliance. And, if the accounting department doesn’t record funds from fundraising, grants, or pledges in the proper financial period according to GAAP, the organization could run into significant issues during its audit — which could jeopardize funding and lose tax-exempt status. Therefore, what would be the best procedures to put in place to keep all departments running smoothly so the accounting books stay up-to-date and accurate? Michelle: You are correct. Accounting needs to be done on a regular basis, and reconciling your records against your bank accounts is of the utmost importance. Some reconcile each month and I’ve even seen some reconcile each day. It all depends on how tightly you want to control your records. Those who reconcile whenever they feel like it or only when push comes to shove can get into real trouble. When I first started bookkeeping, I was startled to find out the head bookkeeper was let go. When I inquired, it was because she had not reconciled the payroll account in three months and someone was embezzling. In your example, you mentioned if the grant writers and fundraising teams don’t communicate properly with accounting that some income could get missed and not recorded which could jeopardize the nonprofit’s status. 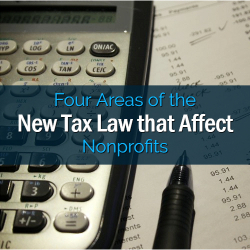 This scenario would only refer to larger nonprofits using an accrual system of accounting. This would not be an issue for smaller nonprofits operating on a cash basis. Michelle Carley’s Final Thoughts on Nonprofit Accounting Best Practices. Michelle: If I were running a nonprofit, I would like to see that the Fund Balance (or money left in the checking account) at the end of the year is equal to at least a year or two of expenses for the organization. I would try to develop a budget that works based on the past year’s revenue and expenses and tweak it each year. If I were a starting a new nonprofit, I would choose to use the cash basis system of accounting over the more difficult accrual basis. And finally, I would watch the revenue closely to be sure it has not reached the threshold for more stringent record keeping and procedures. 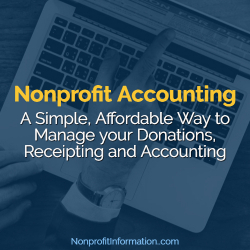 For charities, churches and nonprofits, tracking and receipting your donations, not to mention the rest of your finances, can seem like an onerous task. ACCOUNTS: Bookkeeping, including simple and completely automatic fund accounting. This all started in the early 1990’s when I was the Treasurer for my Quaker Meeting and I bought us a commercial program for what DONATION now does, called ChurchMouse. Unfortunately, after a couple of years it started falling apart, losing data, and doing unfortunate things like allowing a donor with donations to be deleted, but leaving the donations there, owned by nobody! Being an experienced programmer, I realized I could write something much more professional and solid, and DONATION was born. The first version of DONATION was a DOS program used only by my Quaker Meeting. When I re-wrote it for Windows in 1999, I started giving it away for free, under FreeDonationSoftware.org. I finally decided to make it commercial in 2007, and I created Software4Nonprofits.com as its new home. ACCOUNTS was born in 2012, after years of resisting writing a bookkeeping program that would have to compete with Intuit’s QuickBooks and Quicken. More and more of our DONATION users were asking for something comparably simple and affordable, that handled fund accounting properly, so I finally gave in and created ACCOUNTS. We currently have over 7,000 registered users of DONATION, and over 1,000 registered users of ACCOUNTS. Our goal is to be as simple as possible to use, yet powerful, and extremely affordable. We have lots of users who tell us “I’m not very good with computers” but who still find they can use the programs. They also appreciate our responsive support, and comprehensive help files. We regularly have users switch to our programs from other programs that have been discontinued (for example Membership Plus users switching to DONATION), or that are too expensive and complex. Of course, there are many more features in the programs than are indicated in the brief summaries above! Details for DONATION are at www.software4nonprofits.com/features.htm, and for ACCOUNTS at www.software4nonprofits.com/accounts/features.htm. DONATION is not trying to be either a full-featured church management program or a full-featured fundraising program – which keeps it simple and focused! The big “win” in ACCOUNTS comes if you need fund accounting. That is when you have various funds, with running balances that you need to track, and income and expenses associated with those funds. In ACCOUNTS, the fund balances are always automatically completely up to date. Each income and expense account is linked to one fund, and every transaction using those accounts automatically updates the fund balance. Fund Income Statement reports show the income and expenses for each fund, followed by the starting fund balance for the period, the amount of changes due to the net income and any explicit inter-fund transfers, and the ending fund balance for the period. There is no way to get such an obviously helpful report like that out of a conventional program like QuickBooks that doesn’t have fund accounting concepts built into it! One of our principles is being very transparent about our pricing (and everything else!). Both programs can be downloaded, installed and evaluated for free for 60 days. Full pricing information is at www.software4nonprofits.com/pricing.htm for DONATION and www.software4nonprofits.com/accounts/pricing.htm for ACCOUNTS. The purchase prices include a year of support and upgrades. In the 2nd and subsequent years you can pay an Annual Renewal fee of ½ the purchase price for your version, for another year of support and upgrades. You can have multiple databases for multiple organization in each program, except for the Lite version of DONATION. All versions of the two programs are installed Windows programs. The Lite version of DONATION and Standalone versions of both programs are installed on your computer, with their database also on your computer. Local Network versions of the programs are for use on multiple computers within one network (generally one building or set of offices), with the database on one of those computers. Web Network versions of the programs are for use on computers connected over the Internet, and have their databases stored on our servers rather than your computers. There are several different ways to share one database between multiple users, even with the Standalone version. These options are detailed online and in the programs’ help. We are always delighted at how often users tell us that they love the program, and how much better it is than what they were doing before, whether that was manual, Excel, or a different program. You can see some great user reactions on our Testimonials pages, www.software4nonprofits.com/testimonials.htm for DONATION or www.software4nonprofits.com/accounts/testimonials.htm for ACCOUNTS. The DONATION page also has a link to lots of reviews on the independent site Capterra. We invite you to try the free 60-day evaluations of the programs, and hope you will love them as much as the existing users do! You can get to everything on the site by starting from the home page, www.software4nonprofits.com. 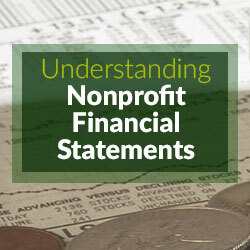 Whether you are starting a new job at a nonprofit organization, joining a nonprofit Board of Directors, or looking to donate money to a charity, it’s important to familiarize yourself with the unique way in which nonprofits present their financial statements. Although most individuals have a general understanding of accounting and the accounting principles, it’s interesting to note that most of what we learn, especially in accounting courses, is generally geared towards for-profit companies, and, as you will see, the way in which nonprofits present their financial statements is a bit unique. Let’s start with the Statement of Financial Position. This statement is similar to the for-profit world’s Balance Sheet in that it lists the values of all the assets held by the organization and the values of all the debts owed, but the Statement of Financial Position also reports the organization’s net assets. Similar to equity, the net assets section denotes the “value” of the nonprofit. This value, however, is further divided on the Statement of Financial Position into restrictions – either temporarily restricted, permanently restricted, and unrestricted net assets. These classifications are used to segregate funding based on any restriction(s) imposed by each donor as to how the funds can be spent. For example, if an individual donates money to a nonprofit organization and limits how the organization can use the funds, that money is considered restricted solely for that purpose. Depending on the nature of the donor-imposed restriction, these funds may be permanently restricted (such as endowments that cannot be spent) or temporarily restricted (such as funds that are to be spent, not held, on a specific project). On the other hand, if an individual donates money to an organization but never specifies on what or how the organization can use the funds, these funds have no restrictions and are therefore classified as “unrestricted”. It is interesting to note that occasionally funds are restricted internally (i.e., management or the Board of Directors decides to restrict how some of the unrestricted funds are to be spent). The funds are still considered unrestricted for reporting purposes but the internal restriction is noted in the Statement or in the accompanying notes (such as in the example below whereby the Board of Directors restricted $1M of the organization’s unrestricted funding for a given purpose). It is important to note when reviewing financial statements that some smaller nonprofit organizations, especially those not using a fund accounting system, may produce financial statements with the term “fund balance” instead of “net assets”. They may also fail to properly disclose the “fund balance” by restriction; however, this is usually corrected on the audited financial statements prepared by the external auditing firm. In addition to segregating net assets based on restrictions, the Financial Accounting Standards Board (per Statement of Financial Accounting Standards No. 117) requests organizations to further report — either in the net assets section of the Statement of Financial Position or within the financial statement notes — any assets that are donated to the organization with “stipulations that they be used for a specified purpose, be preserved, and not be sold” (i.e., land or works of art) or assets donated with “stipulations that they be invested to provide a permanent source of income” (i.e., endowments). The next financial statement that you will see presented after the Statement of Financial Position is the Statement of Activities. This statement is in lieu of the Income Statement that is used by for-profit companies, and it reports the change in permanently restricted, temporarily restricted, and unrestricted net assets. As shown below, this is accomplished by listing each net asset fund in a separate column. Expenses, which are by nature considered “unrestricted” even if they were spent with restricted funds, will appear solely in the unrestricted column, and the revenues tied to those expenses incurred using restricted funds will appear in the line item “net assets released from restrictions”. 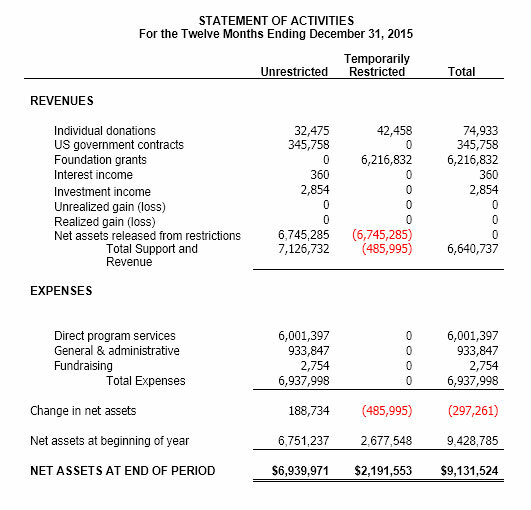 Accountants will typically state that those revenues were “released” from their donor-imposed restrictions once the expenses were incurred, thus the Statement of Activities will present a decrease in these restricted funds and an increase in the unrestricted funding for the same amount in the revenue section of the statement (as seen in the example below). As opposed to an Income Statement which shows a profit or loss, the Statement of Activities instead shows a positive or negative change in each net asset fund. In the example above, you will see that the amount of temporarily restricted revenue collected during the reporting period was less than the expenses incurred using temporarily restricted funding (the sum of the temporarily restricted revenues is less than the amount of temporarily restricted revenue released from restrictions). Thus, there is a drop in the ending balance of the temporarily restricted net assets. Individuals used to reading for-profit financial statements typically consider this a “loss”; however, nonprofits are not in the business of making a profit (or a loss), thus this is an incorrect assumption. Instead, the financial statement is showing that the organization expended some of the net assets that were obtained in a prior financial period(s). This is not a loss but utilizing funds for their intended purpose (thus meeting the donor-imposed restrictions). If you are interested in assessing the organization’s financial stability, it is best to analyze the financial statements for the past five or so years to ascertain if the organization has been consistently utilizing its net assets and not replenishing them with additional funding as this could possibly indicate long-term instability. 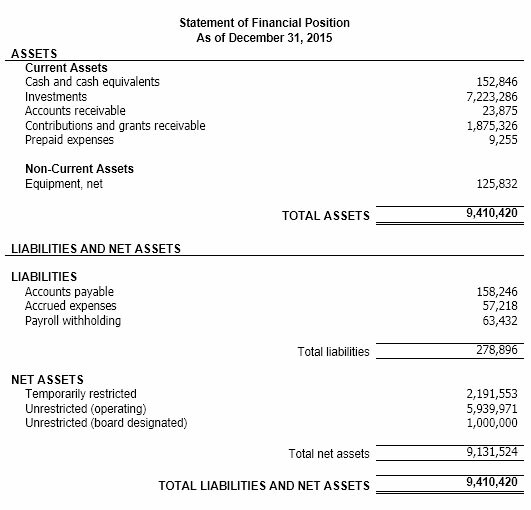 As noted earlier, net assets denote the value of the organization. However, since restricted net assets cannot easily be used by the organization (without satisfying the donor-imposed restrictions), it is quite common in the nonprofit world to consider the organization’s unrestricted net assets to be the actual value of the organization. Thus, if the organization had to close its doors, those unspent funds held that were restricted for use would have to be returned to the donors since the organization did not earn them. Lastly, to show the correlation between the two financial statements that we covered, you will notice that the ending value of each net asset fund listed on the Statement of Activities matches the same amount listed on the Statement of Financial Position. Another financial statement produced by nonprofit organizations is the Statement of Cash Flows, which is produced following the same procedures used by for-profit companies. This statement shows the inflow and outflow of cash within the organization. 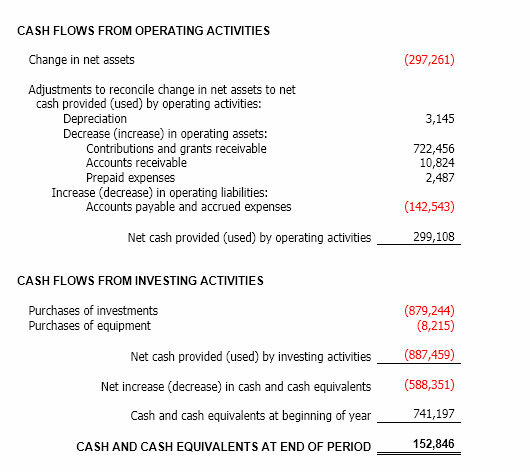 As shown in the sample statement below, the cash flow starts with the change in net assets – which equals the amount listed on the Statement of Activities. The changes in the balance sheet accounts are then added to this amount to derive at the total increase or decrease in cash. When this total amount is added to the cash balance at the beginning of the reporting period, you will end up with the current cash balance, which will match the amount listed on the Statement of Financial Position. Finally, nonprofits will also produce a Statement of Functional Expenses. This statement will detail the expenses incurred during the reporting period and allocate it by program services and support services. Best practice, although not required, is to break-out the program service costs by the organization’s various programs and list the expense categories from highest to lowest. 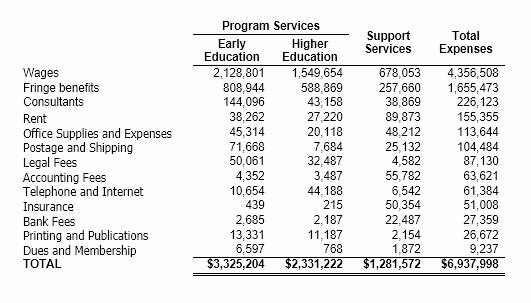 Program services are considered “direct costs” as they are the mission-related activities performed by the organization, while support services include such costs as fundraising, overhead, management and/or general administration. Again, all of the financial statements are connected. For the Statement of Functional Expenses (as shown in the example above), the total expenses will equal the same amount reported on the Statement of Activities. 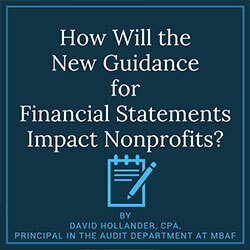 These four statements represent the primarily financial statements that nonprofit organizations prepare; however, some may include additional statements that provide even more insight into the organization’s finances. Familiarizing oneself with how these financial statements are developed will undoubtedly help users better understand a nonprofit organization’s financial position. And, from this standpoint, users can more easily begin to interpret the statements through such techniques as common-sizing and performing ratio analyses to get a better understanding of how the organization is performing financially – a key skillset for anyone working or doing business with a nonprofit.